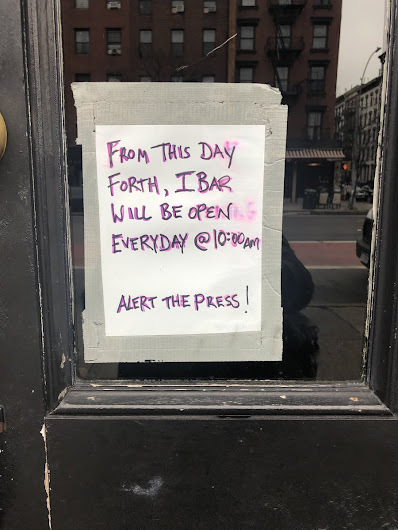 All this breaking news led to a conversation about what bars in the area still open at 8 a.m. O'Hanlon's on 14th Street? Spring Lounge on Spring? (Milano's on East Houston opens at 9 a.m.) Where else?Anyone? Big Lee's Hard Swallow opens 8am on Friday and Saturday mornings. Big Lee’s hard swallow on 1st ave between saint marks & 9th opens at 8am on Friday and Saturdays. Sunday’s 10am. Muldoon's. 3rd Ave between 43rd/44th. 8AM.